Take Five a Day » Blog Archive » A ‘Clean’ Contest Courtesy of Fuller Brush Co – WINNER! A ‘Clean’ Contest Courtesy of Fuller Brush Co – WINNER! And the winner is…..Mike Manifold! Mike, shoot Tizmanian an email at tizmanian (at) yahoo (dot) com with your physical address so we can get your prize mailed out! We loved all of the entries in this one so we had to select the winner randomly. More contest fun to come! Occasionally we get asked to review products that fall outside of our normal wheel house (heh) and this is one of those times. 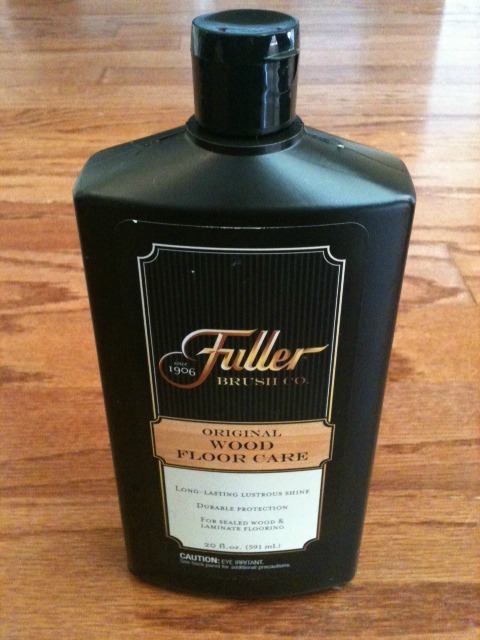 The Fuller Brush Company provided samples of their wood floor care product to me and asked if we would post about it. Rather than take a few bucks, I said I would give it an honest review as long as they provided one (1) product sample free to one of our readers and they agreed! So, before the contest rules, the review! Mrs Tizmanian was gracious enough to give their product a spin as we happen to have hardwood floors in our home. We have two dogs and two younger Tizmanian’s running around so they get a real workout. I know, I know. Some of you may think I just suckered the wife into some 1950’s role play, but truth to tell, she keeps Casa Tizmanian sparkly and clean all the time and what do I know about keeping floors clean? My idea of wiping up a spill is to use my socks. So, it looks like it’s a winner – it cleans, has a nice finish, and is easy to use. How about that? Now – on to the contest! Using the comments section to this post, explain what your favorite home delivery product was as a kid…for those too young to remember home deliver, list what you wish you could have delivered to your home (keep it clean folks – we’re family friendly here). Two posts per day allowed. Contest will end on next Friday, Feb 3rd. I will announce the winner on Saturday, Feb. 4th. U.S. residents only I’m afraid as the winner’s prize will be shipped directly to their homes from The Fuller Brush Company. Congrats to Mike Manifold, but with no new post I just hope he sees this! In my family if one of us kids did something wrong, and the guilty party failed to fess up, we all got busted. This really ticked me off. I was tired of spending countless hours in my room for crimes that I did not commit. One day I was reading the ads in the back of a magazine (I think it may have been my brother’s Mad Magazine) and I found an advertisement for a children’s fingerprinting kit that you could send away for. At last! I thought – a solution to my problem! I saved up all of my allowance money for months, since I only made a buck a week. Finally, I had enough money to send away for the kit. I eagerly waited for it to arrive in the mail, and fantasized about future crimes that I was going to be able to clear myself of. The next time my brother threw a ball to the dog, broke something, and tried to crazy glue it back together it would be HIS fingerprints that would be found. The next time my sister messed around with my dad’s record player and scratched his records it would be HER fingerprints at the scene of the crime. Finally, I had found freedom from countless hours of unfair groundings! The kit arrived in the mail, and I thought it was the coolest thing I had ever bought. I was serious. Unfortunately, my parents did not take the kit as seriously as I did, and I never was able to use it to exonerate myself. But it was by far the coolest thing I ever had delivered to me! I remember growing up in a time when quite a few products were home-delivered, but the one that comes to mind first when I recall that time is one that, today, is relatively unheard of and, for many of our younger people, would probably evoke a number of questions, the first of which might be “Why?” or “Huh?” probably followed by “Whatever!”. (this could be a great opener for the Bulwer-Lytton Fiction contest, but I digress). While I have tried to “keep it clean”, the nature of the product probably undermines that theme. That product is coal; hard, black, dusty, lumpy pieces of what looked like chiseled rocks. Before gas and electric heating, (and hecka before solar power), coal was a primary source of energy for home heating, often competing with oil. The house I grew up in wasn’t converted to gas until the late 1950’s, so, until then, we had to rely on coal, especially during the sometimes harsh winters in Western New York. Our coal burning furnace was a giant behemoth with a great body, cast iron door and large round pipes spread around the basement like the arms of a giant octopus. It had to be fed with shovelfuls of coal and coal ash had to be removed from it regularly, but what fascinated me most about the whole process of using this fuel was the method of delivery. Beginning in late autumn, A dust laden dump truck, driven by a man I knew only as “Mr. Truscott”, would back into our driveway and slowly steer to a small window at the side of our house. Mr. Truscott would park with the rear of the truck angled toward that window, which was no more than 2 feet high and just a few inches above ground level. After talking to my parents, he would go into the basement, open the window, which was hinged at the top, fasten a hook into an eyelet in the ceiling to keep it open and return to his truck. He would then angle the “dump” section of the truck up slightly, fasten a semi-round chute to the back of the now tilted bin and point the other end of the chute through the open window. After opening a slide which opened the back of the truck to the chute, he would coax the coal through the opening and onto the chute which would carry it through the open window and into what we called the coal bin, the section of the basement where coal was stored. When the delivery, which usually weighed about one or two tons, was completed, he would close the window, put all of his chutes back on the truck, lower the “dump” and be on his way after leaving my parents the bill for the delivery. After “supervising” the unloading, I would often go into the basement and admire the large black mound of fuel he had left for us on the concrete floor as the dust settled around it. This was cool stuff for a kid who wasn’t quite ten years old yet. Believe it or not, my family used to receive news via a printed medium, I think it was called a “newspaper”. Back in the day, we would have needed to either go to a “news stand” to pick it up, or for easier reading would have it delivered to our house. Seriously, I’m NOT making this stuff up! Either a kid on a bike or an older gentleman in his car would throw it onto our porch or into our yard, and we would go out to retrieve it. Oh the memories of my youth! I remember sending in the UPCs for the mail away Cobra Commander with Hood action figure and then after weeks of checking the mail box multiple times a day, the total excitement of opening the package; and then the sinister plans made in the living room GI Joe scene that followed…. When I was about 10 years old, I loved to eat Bazooka bubble gum. I quickly learned that if you could collect enough of the little cartoons inside, you could mail them away for a free camera (along with maybe a buck or two for shipping & handling). I’ll never forget the day it came in the mail! My Mom took me to buy the correct film, and I took pictures of my family, our house, the bushes in the front yard my Dad had just planted, and neighborhood friends. Once the film was developed over at the FotoMat, I was able to see the fruits of my labor. I still have those photos, and while not the best quality, I am still reminded of the fun that camera gave me. I remember sending in the UPCs for the mail away Star Wars “Return Of The Jedi” character known then as The Emperor (now known as Darth Sidious) and then after weeks of checking the mail box multiple times a day, the total excitement of opening the package; and then the world-obliterating evil in the living room Star Wars scene that followed…. I suppose this counts, but whenever I heard the Ice Cream Man — and even when I THOUGHT I heard him — it was always a mad dash first to Mom for some money, and then out the front door to figure where he was in the neighborhood. Mmm, the smell of that frozen paper and a fudgcicle with that layer of frost — YUM!! Like Tom I remember visits from the distinctive cream-yellow “Scwhann-man truck,” as we would call it. The logo actually is a swan I think. Anyway, “Schwann-man” frozen burritos, personal pizzas, and orange juice concentrate were a staple in my house once my mom went back to work. I guess the delivery person was always a man in our area. Back in the early seventies, the Charles Chips man would go door to door in Endicott, N.Y. selling tins of potato chips, pretzels and corn chips. Being about 6 years old at the time, I thought it was amazing a guy would show up at my Grandparent’s house with snacks! My Grandmother always bought a tin of potato chips and pretzels to have around. If my sister and I were really good, she would buy a plastic tub of corn chips! By the late seventies, they had stopped door to door sales. A few years ago my grandmother passed away. We were cleaning out her house and I found in the basement a slightly dented Charles Chips tin. I don’t think the rest of my family understood why I wanted it so bad, but it now sits with a bunch of other collectables I have. When I was really little, the Curlys Dairy man used to deliver milk and dairy products to our house. I was always excited when my mom got cottage cheese with pineapple in it, that was my favorite. And you should have said Miz Tiz. Ha. Tom, you said Schwann’s “man” too. Is this some part of our collective consciousness or was this phrase part of their advertising scheme. Anyway, I’m sure nowadays there are Schwann women too. Spoken like Jimmy Fallon: Thank you AT&T, for helping to prematurely reach my contest entry two-per-day limit. Neat! Thanks for another contest!! !